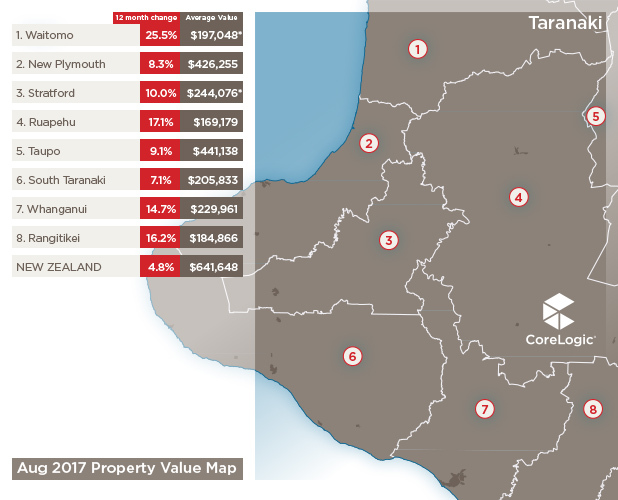 Thanks to the weird and wonderful political world of the upcoming General Election, NZ property market commentary is bulging at the seams, so this month I’m taking a more light-hearted look at our property values across the country. Other than delving into property insights, my other big passion is sports. Lately, I’ve been enjoying the Mitre 10 Cup, the National Provincial Championship (NPC) for our beloved national sport of Rugby. It’s renowned for stirring up the passion of home town team support, with the playing squads often filled with locally based players, many of whom earn most of their living by working other jobs. 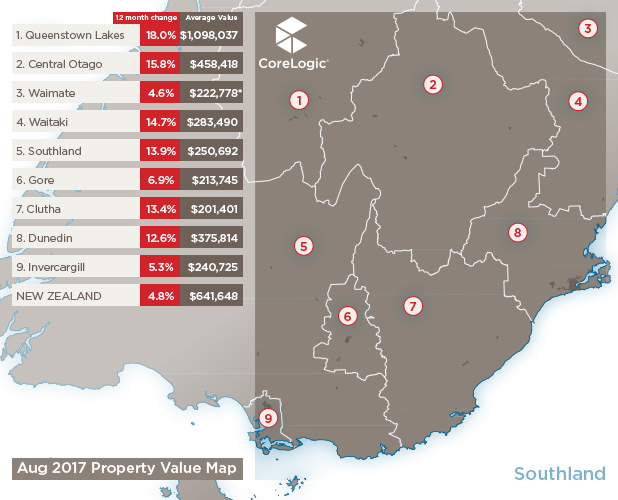 So, combining rugby and property - how have each of our provinces performed in their season equivalent. Who’s the Canterbury rugby team, the juggernaut? 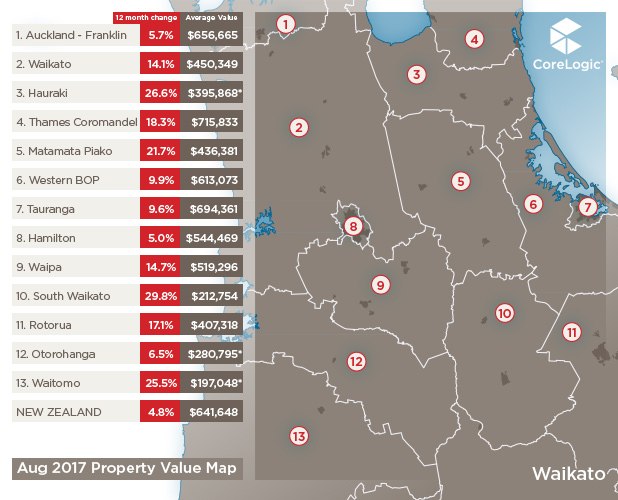 Who’s the Waikato equivalent, a little bit inconsistent in their growth? Who’s this year’s Southland, a little disappointing and lacking in recent form? And of course who’s this year’s Northland, the surprise package? To those who don’t share my love of Provincial Rugby, don’t fret: I’ll still cover off our key market metrics, so keep on reading. Firstly let’s look at the key overall stats. 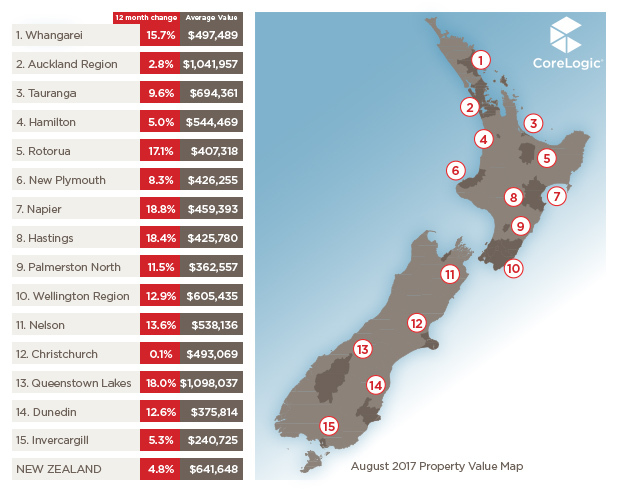 According to the QV House Price Index stats for August, nationwide values slowed even further (now at only 0.1% monthly growth). Annual growth was 4.8% - the lowest rate since August 2012. 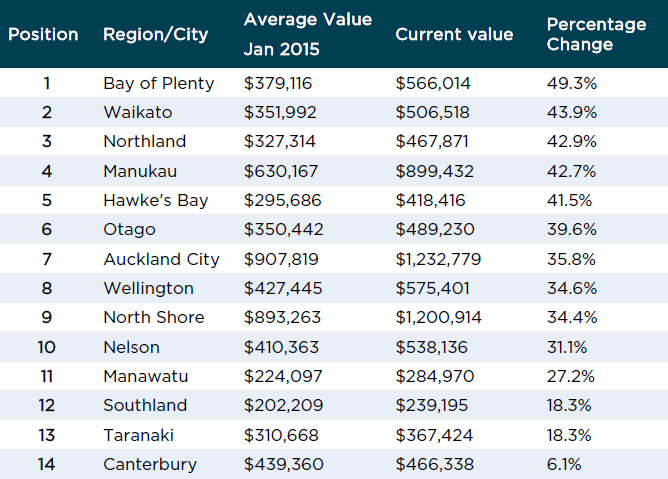 Auckland annual value growth is now only 2.8%, with quarterly growth now in the negatives (-0.2%). 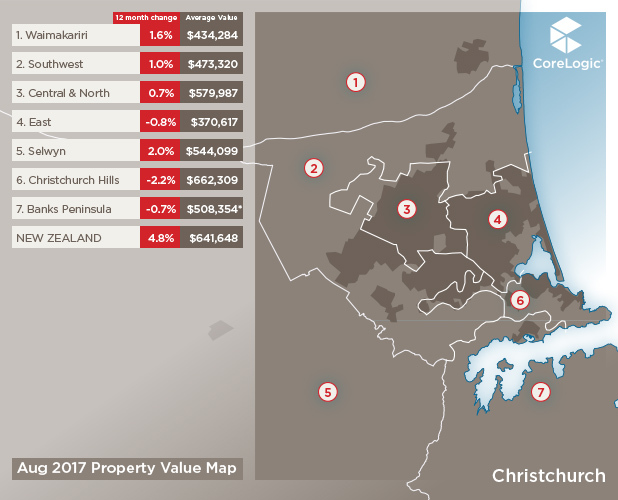 Wellington also saw a drop in the last three months (-0.4%), and the negative trend is still evident in Christchurch too (-0.4%). 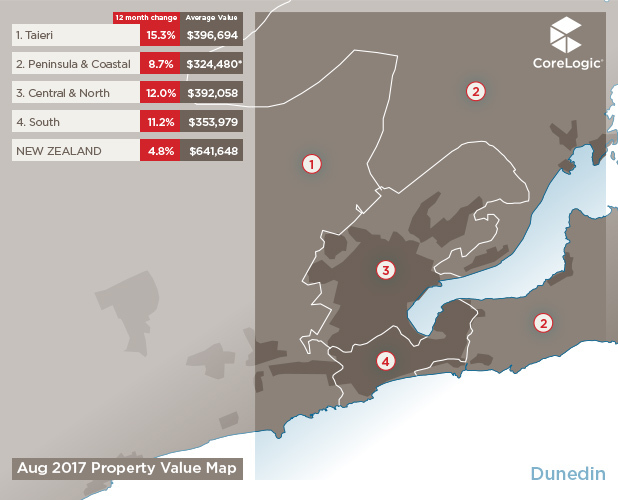 Tauranga maintained relatively strong growth of 1.7% quarterly and 10% annual growth, and Hamilton has seen a mini-resurgence of values (up 1.4% quarterly), although the annual figure does remain at 5%. 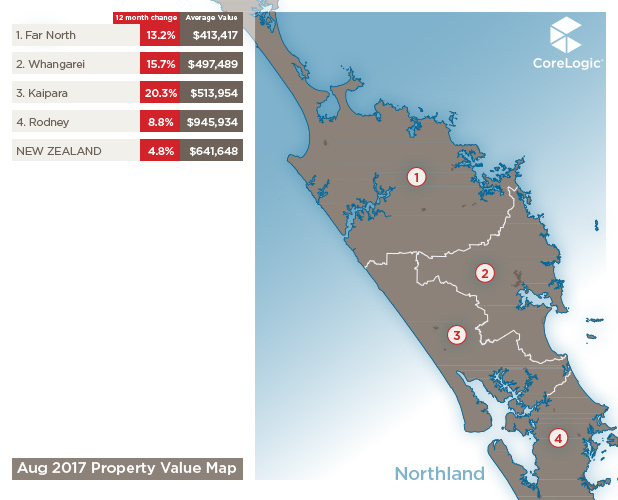 In Dunedin there wasn’t much change, with 0.5% quarterly change and the annual rate holding steady at 13%. Of course the data isn’t perfectly grouped to match the Rugby version but it’s not too different. 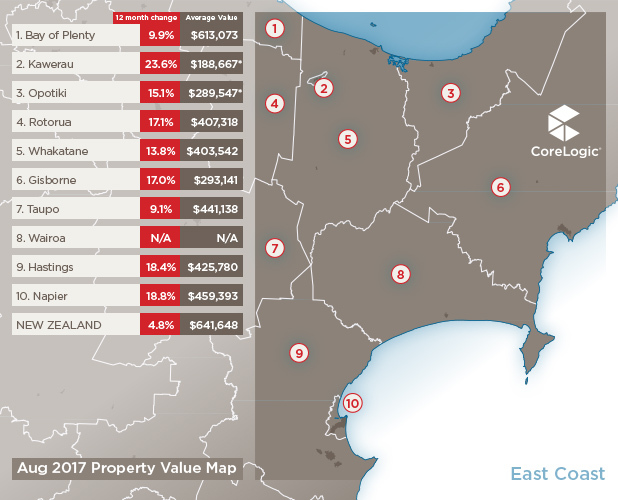 Using the QV House Price Index we have 14 grouped regions/cities and now that we’re pretty much at the end of the most recent growth cycle we’ll use the growth over that cycle as our measure to compare between the provinces. So the percentage change in value since January 2015, up to to September 2017. And to keep it interesting we’ll split the ‘season’ (growth phase of 32 months) in half to track the early starters and strong finishers. 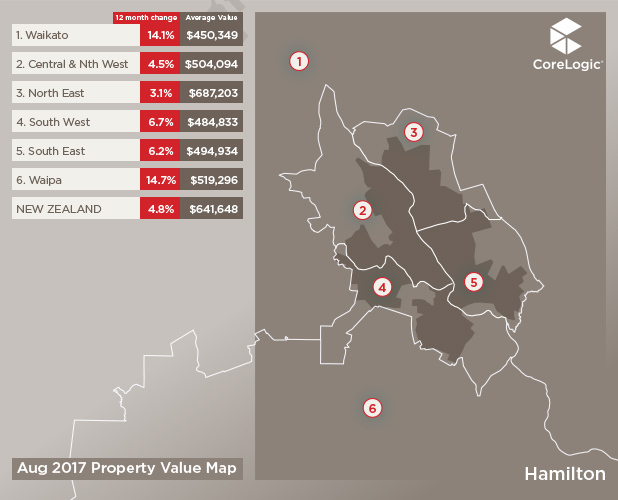 Manukau (our proxy for Counties-Manukau) was the strongest in the first half of the period analysed, and as with the rest of the Auckland area this was in fact a continuation of growth since 2012. 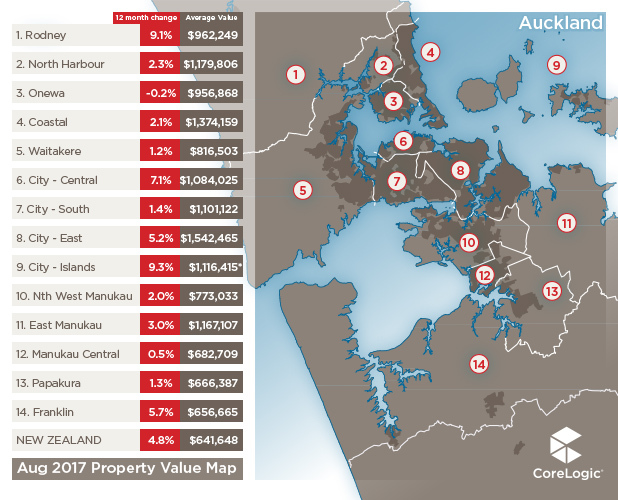 29.0% growth from 1 Jan 2015 to 1 May 2016 (half way) gave it a strong lead on the chasing pack with North Shore (North Harbour in the Rugby) 5.7% behind and Bay of Plenty keeping the Aucklanders honest at 21.4%. Auckland City (Central) also saw 21.4% growth over this period, with Waikato a further 1.4% back on 20.0% growth over those first 16 months. So the big centres in the top half of the North Island were flexing their muscles, could they keep it up though and who was struggling? Here’s the full table at the mid point (1 May 2016), with Canterbury lagging (the opposite to their Rugby team!) and Taranaki, Southland and Manawatu also struggling to find ‘form’. 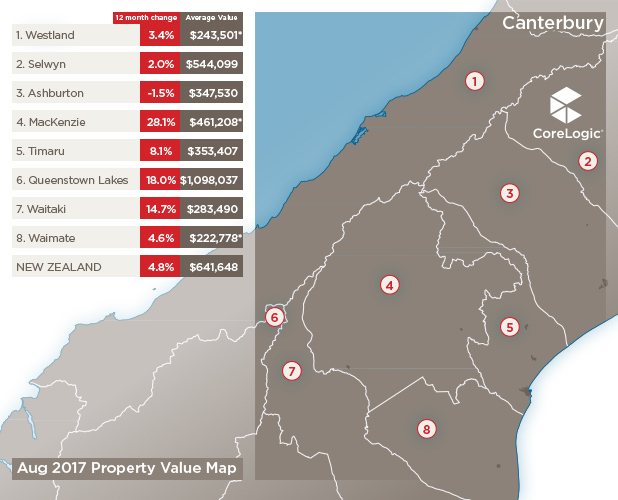 Looking at Canterbury, it’s worth pointing out that the region was significantly affected by the 2010 and 2011 earthquakes which reduced property stock and increased demand in the short term as the rebuild got underway. 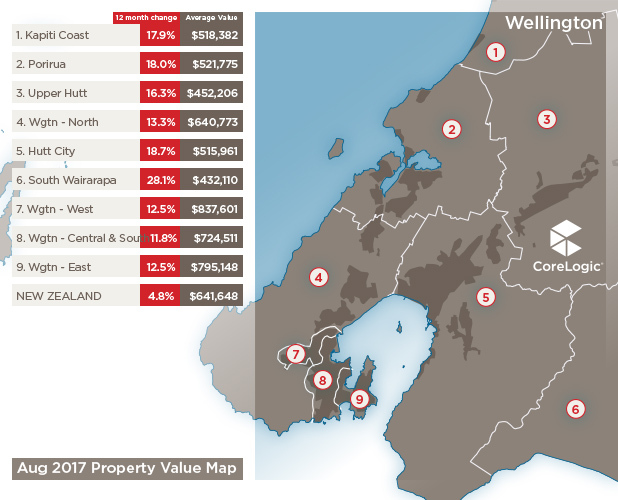 This meant its property values grew out of cycle with most of the rest of NZ and by 2015, while most other areas saw little value growth, it had appreciated by almost 30%. Back to the competition then and Auckland’s momentum had been halted in the back end of the ‘season’. The outstanding first half performance couldn’t be maintained, yet in the Bay of Plenty things only got stronger with a final ‘points haul’ of 49.3% growth over the full 32 months. 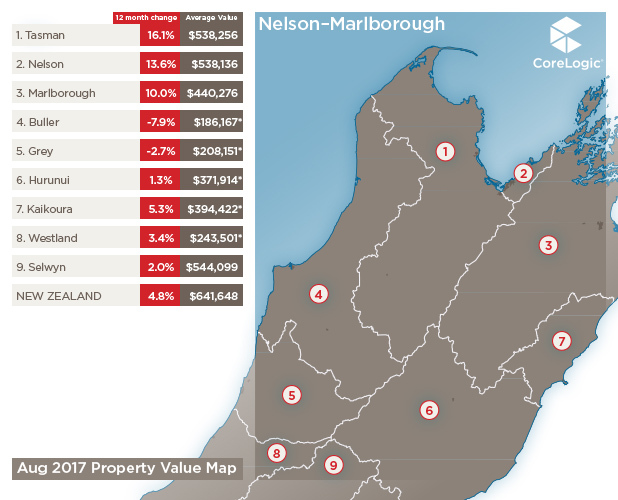 Waikato also stayed strong but a few points back on 43.9% while my beloved Northland takes out third with 42.9% growth over the period. 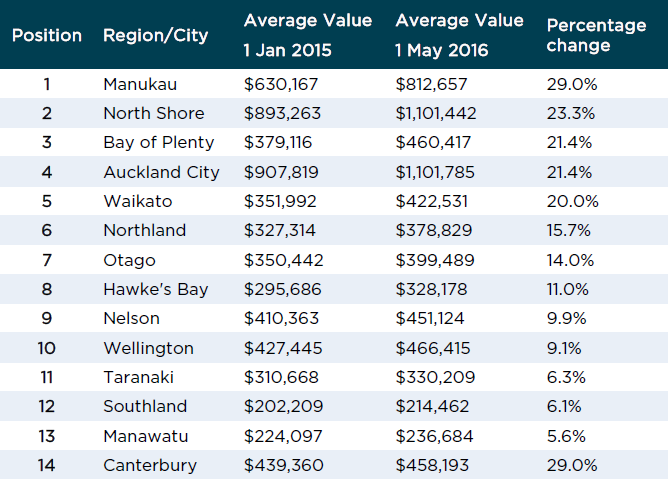 Manukau was slightly behind on 42.7%, while Auckland City dropped back to seventh and North Shore to ninth. Manawatu found some form but couldn’t get out of the bottom four, while Southland and Taranaki grew by less than 20% and poor old Canterbury stays rooted to the bottom of the table with only 6.1% increase over the entire period. 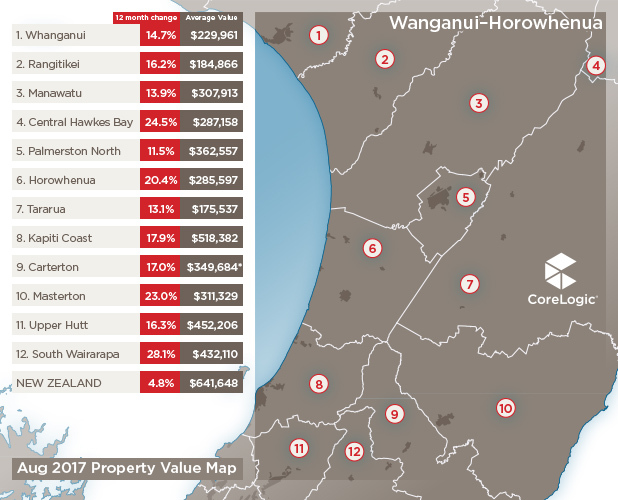 Bay of Plenty have been the property juggernaut, Manukau and the North Shore probably represent the inconsistent Waikato Rugby team, Canterbury are the Southland of the property market in the last few years, and maybe Northland or Hawke’s Bay (5th with 41.5%) are the surprise packages. A bit of fun and none of the really big guns winning out so that’s gotta be a good thing, right?! (Go the mighty Taniwha! ).